Let’s discover together the special cuisine of the country by stimulating our senses of smell and taste. 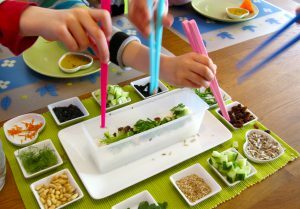 The children will explore new savoury and sweet delicacies, recipes that they will cook under the guidance of a Culture Kids animator. New ingredients, herbs and spices of faraway countries will spark their imagination and allow them to create a typical dish or speciality to share together or to take home. A unique and shared experience, enriched with flavours and surprises.